The Town Code provides for an Environmental Conservation Officer and staff from the Town’s Department of Environmental Resources to patrol Oyster Bay Harbor, Hempstead Harbor, Cold Spring Harbor, Long Island Sound and South Oyster Bay. Their chief responsibilities are to promote the protection of our marine environment through environmental surveillance and, where necessary, through the issuance of summonses for illegal shellfishing and other environmental violations. In cooperation with the New York State Department of Environmental Conservation and the Nassau County Department of Health, regular surface water quality testing is conducted. With the assistance of the Coalition to Save Hempstead Harbor and the Hempstead Harbor Protection Committee, a water monitoring program is conducted regularly in Hempstead Harbor. Results can be found on www.hempsteadharbor.org. The Town’s Department of Environmental Resources conducts a Bay Management Program within the Bay Management area off West Shore Road in Oyster Bay Harbor. Seed clams and mature clams are transplanted to this area for cleansing or spawning and future availability, on a limited basis, to local baymen. Clams from uncertified waters are periodically relocated to certified waters to enable them to cleanse themselves. Also, clams growing in certified waters in colder portions of the harbor are transplanted to warmer certified waters in the harbor to promote better spawning. The department also conducts an annual Seed Clam Program aimed at replenishing the hard clam population. Approximately five million seed clams are set out in protected north shore and south shore waters. Within four years, the seeds mature into harvestable clams. In 2007, the Town began planting 250,000 oysters in both north and south shore waters. Oyster Bay Harbor, Cold Spring Harbor, Hempstead Harbor and all of Long Island Sound and its other embayments have been designated “No Discharge Zones” by the federal U.S. Environmental Protection Agency. 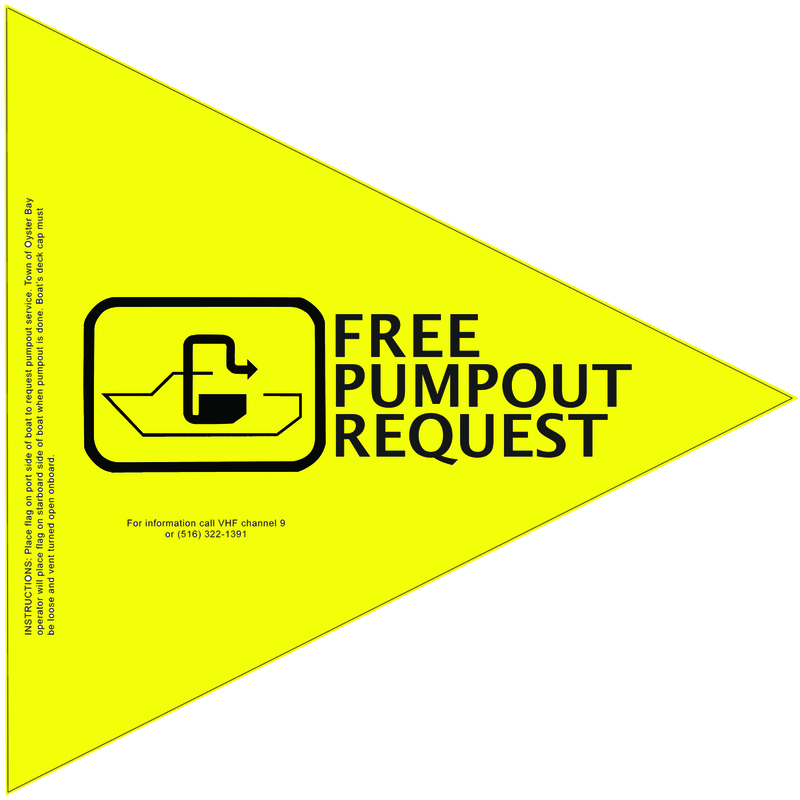 This means boats must use pumpout stations – stationary or mobile. The Town’s Department of Environmental Resources maintains two floating pumpout stations within Oyster Bay Harbor. These free facilities make it as convenient as possible for boaters to discharge wastes in a manner that protects the delicatemarine ecology of the harbor. The unmanned floating stations are in operation 24 hours a day throughout the boating season. The stations are equipped with hand pumps and easy to follow directions. 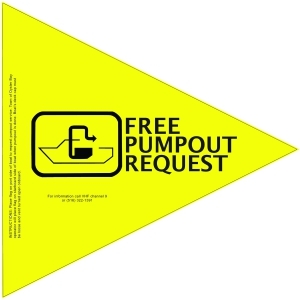 The Town also maintains stationary pumpout stations at Theodore Roosevelt Marina in Oyster Bay, Tappen Marina in Glenwood Landing and Joseph J. Saladino Memorial Marina on the south shore. In 2010, the Town of Oyster Bay has spearheaded the formation of the Oyster Bay/Cold Spring Harbor Protection Committee, and the Town was subsequently awarded a Long Island Sound Futures Fund grant in the amount of $60,000 to hire a project coordinator to develop a work plan. “At the time the Town applied for the grant and started the committee, the Oyster Bay-Cold Spring Harbor watershed was the only watershed in Nassau County that was not represented and managed by a protection committee,” Supervisor Saladino stated. “With increasing pressures on the watershed from development, increased recreational use and storm water runoff, the time had come to bring those communities that border the watershed together to develop an integrated management plan for the watershed. The Supervisor went on to say that the coordinator’s responsibilities will include developing a mission statement and work plan; investigating various options for the legal structure, decision-making, funding mechanisms and procedures for the municipalities that join the committee; developing a Web site; conducting educational outreach; and coordinating with Friends of the Bay in the development of a Watershed Action Plan. The Supervisor added that the Long Island Sound Futures Fund grant program pools funds from the U.S. Environmental Protection Agency (EPA), National Fish & Wildlife Foundation (NFWF), U.S. Fish & Wildlife Service and FedEx for projects to restore the health and living resources of Long Island Sound. The Department of Environmental Resources publishes an annual tide table, which lists the times of all high tides for both the north and south shores of the Town. The charts are available, free to the public, at Town Halls North and South, Theodore Roosevelt Memorial Park, John J. Burns Town Park, the Town’s DPW Facility in Syosset, and the Department of Environmental Resources in Oyster Bay. Members of the Department of Environmental Resources travel across the Town to many classrooms and clubs to educate students the importance of recycling. Each lesson is geared to the appropriate age of the group. For more information call (516) 677-5811. Recycling is using something over again. Glass jars and bottles, aluminum and metal cans, newspapers, magazines and mixed paper, leaves and yard waste, electronics, used motor oil, automobile batteries, propane tanks, and plastics are some of the things that can be recycled after we’ve used them. For many years, we threw these things away as trash. But now we know that these materials are valuable and can be used again and again. When we do this, we have less garbage to dispose of and we don’t need to take as many natural resources from the earth and the forests. 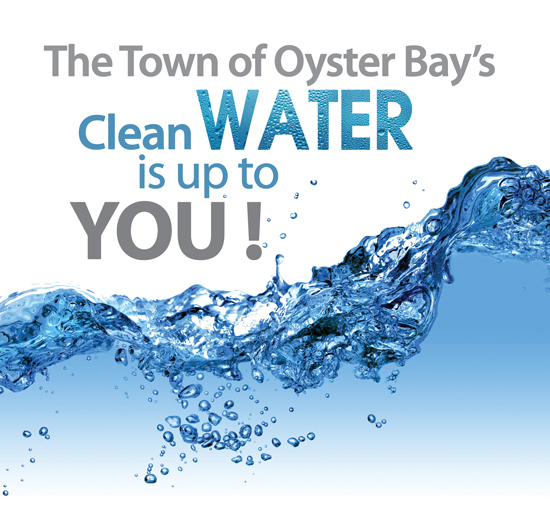 Our Town’s recycling program is called S.O.R.T., which stands for Separate Oyster Bay’s Recyclables Today. We’re separating our recyclables from our regular garbage so they can be collected by special S.O.R.T. trucks and made into new products. 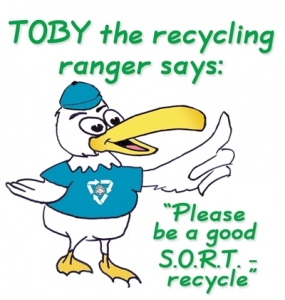 I’m counting on you, as a Town of Oyster Bay Recycling Ranger, to help your family and friends S.O.R.T. their recyclables every day. Congratulations on your new job and I’m happy to have your help. Members of the Department of Environmental Resources travel across the Town to many classrooms and clubs to educate students the importance of not feeding waterfowl. Each lesson is geared to the appropriate age of the group. For more information call (516) 677-5811. The Town’s GeesePeace program works to humanely reduce the local geese population while encouraging them to migrate to areas that allow us to peacefully co-exist. The public can help the effort by not feeding geese (and other wildlife). Humans feeding geese are a root cause of problems with geese. People feed geese bread, crackers, and other processed foods that are unhealthy for them and can lead to bird diseases. Feeding geese causes them to be aggressive and must be eliminated before they will leave. Domestic animals can be our best friends. The Town of Oyster Bay’s Department of Environmental Resources is dedicated to teach children the principles of kindness and compassion for animals and to provide them with the knowledge, understanding and tools needed to help make a difference in their community. Each lesson is customized to the appropriate age of the group. For more information call (516) 677-5811. The Town of Oyster Bay has pristine beaches and beautiful waterfronts stretching from the Atlantic Ocean on its southern border to the Long Island Sound on the North Shore. The Town’s Department of Environmental Resources’ marine environmental outreach program exudes our passion for marine conservation and education exploration. Members of the Department of Environmental Resources travel across the Town to many classrooms and clubs to educate students the importance of the preservation of our marine environment. Your group will be provided with a voyage beyond books. Your educational journey will include information on Oyster Bay’s clams and oysters, in addition to many marine life artifacts. Each lesson is customized to the appropriate age of the group. For more information call (516) 677-5811. The Town of Oyster Bay has pristine beaches and beautiful waterfronts stretching from the Atlantic Ocean on its southern border to the Long Island Sound on the North Shore. The Town’s Department of Environmental Resources’ hosts cleanup events with volunteers and Town employees rolling up their sleeves (and, in some case, pants legs) to conduct a thorough cleanup of beaches and shoreline areas along Oyster Bay Harbor on the northshore and South Oyster Bay and Tobay Beach on the southshore. The Town of Oyster Bay, Friends of the Bay and the Oyster Bay Power Squadron all join forces to sponsor the Annual Oyster Bay Harbor Spring and Fall Harbor Cleanups. In addition, the Town of Oyster Bay has partnered with the Jones Beach Power Squadron, a unit of the United States Power Squadron in a program called W.A.K.E. U.P. ( Waterways Adopted Keep Environments Undamaged and Protected), which is designed to help clean up our south shore waterways. These programs benefit wildlife and plants by creating cleaner, trash-free habitats. They also serve to educate the volunteers involved with the cleanup about environmental responsibility and stewardship by giving them a firsthand view of the impact trash has on our canals and bay. There is no better education about the harm garbage causes marine life and boaters than by bagging it for several hours. The program will also benefit water beyond our bay and canals. Volunteers play an important role in maintaining the health of the Town’s bay and canals. For those of you who are looking for a great way to help preserve our natural marine resources, we urge to contact the Department of Environmental Resources at 516-677-5811 to find out how you can become part of the preservation of our marine environment movement. Oyster Bay Town Receiver of Taxes James J. Stefanich (left) recently attended the Annual Oyster Bay Harbor Fall Cleanup Day, held at Theodore Roosevelt Memorial Park in Oyster Bay. Receiver Stefanich is seen here with a few of the over 200 volunteers from the East Woods School in Oyster Bay, who showed up to help with the cleanup efforts. On September 17, the Town of Oyster Bay, Friends of the Bay and the OysterBay Power Squadron joined forces to sponsor the Annual Oyster Bay Harbor Fall Cleanup Day, according to Receiver of Taxes James J. Stefanich. Receiver Stefanich went on to say that more than 200 individuals and groups participated in the cleanup, and some groups such as Adelphi University and Massapequa High School came by busloads to volunteer for the event. “Oyster Bay Harbor is an important natural resource, providing recreational and commercial opportunities, as well as serving as critical habitat for shellfish, fish and other types of marine life,” Receiver Stefanich stated. The beach cleanups help preserve the scenic beauty of the beaches and shoreline areas and help improve water quality by removing debris. They also reduce potential harm to coastal wildlife and marine life. “If you swim, boat or fish in Oyster Bay Harbor, or just want to help protect and enhance the beauty and environmental integrity of this beautiful waterway, then you know the importance of keeping our environment clean.” Receiver Stefanich said. Members of the Department of Environmental Resources travel around the Town to educate students the importance of “rain gardens.” A rain garden allows good drainage from otherwise impervious areas, that effectively reduces storm water pollution, flooding, and erosion by allowing the rain water to soak into the ground. The Town of Oyster Bay’s first rain garden was completed in conjunction with the Nassau Soil & Water Conservation District and the Town’s Department of Environmental Resources Animal Shelter and students from Friends Academy. The garden is located in front of the shelter on either side of the main entrance. The first rain barrels were also successfully installed at this site. The rain barrels contain and store rain water from rooftops that can be used for watering and other purposes. Additionally, the Town’s Department of Environmental Resource will assist students with volunteer and scouting projects in creating and building rain gardens. For more information call (516) 677-5811. Oyster Bay Town Councilwoman Rebecca M. Alesia (left) recently visited with local Boy Scout, and resident of Plainview, Gerard Theophilidis (2nd from left) from Boy Scout Troop #60 in Lindenhurst to survey the new “rain garden” that Gerard installed in Marjorie R. Post Community Park, in Massapequa, as part of his Eagle Scout project. A rain garden allows good drainage from otherwise impervious areas, that effectively reduces storm water pollution, flooding, and erosion by allowing the rain water to soak into the ground. Councilwoman Alesia and Gerard were joined in this picture by Gerard’s proud parents, Carmen and Gerard Theophilidis. “The 29th Annual Dune Stabilization Project at Tobay Beach is scheduled for Saturday, March 25, 2017. The day promises to be another resounding success, attracting over 1,160 volunteers,” Oyster Bay Town Supervisor Joseph Saladino states. The Supervisor went on to say that the Dune Stabilization Program, which began in 1989, is an immensely popular volunteer project for residents of all ages, as well as an important component of the Town’s beach preservation efforts. “This is one program where people can see the results of their efforts, which I believe accounts for its popularity,” Supervisor Saladino stated. “The dune grass they plant is directly responsible for preserving the dunes and beach they enjoy during the summer. The Supervisor noted that contributing to the success of the program was, as in past years, local businesses and community groups, which donated food and equipment. “This year,” he said, “volunteers will be fortified with hot New England clam chowder prepared by Mill Creek Tavern with clams provided by Frank M. Flower & Sons, as well as cookies, coffee and hot chocolate. Shope Rite of Massapequa also donated snacks and other healthy foods.